The 2013 MLS SuperDraft may be a few months away but with the college game well into their regular season, it is a perfect time to start examining who will be some of the top prospects for the draft. After seeing eight or nine weeks worth of games, we have a good sense of who most players are up to this point. If you want some super in-depth coverage of the college game I have to direct you to TopDrawerSoccer.com, those guys are simply the best at covering the college game. Okay, without further ado, below is my initial list of college prospects. There is no real order to this list (yet), once College Cup rolls around I’ll begin doing a draft board and mock drafts. So for now, this is a running list of the top players that I see coming out after this season. Carlos Alvarez -M – UConn – The kid is a play maker in the middle for the Huskies. It seems he has his feet involved in nearly every UConn goal this year. He has solid vision and is excellent with both feet. Will Bates – F – Virginia – I swear I’ve had this kid on my list for the last three years. He’ll finish up with UVA this year and will certainly be an interesting prospect for some MLS team out there. Yannick Smith – F – Old Dominion – If you are looking for the next CJ Sapong, look no further. Smith terrorized the NCAA with a breakout junior season of 16 goals in 20 games and has done pretty well this season for the Monarchs. He’s a bit undersized but he has the speed to be a dangerous winger at the next level. Dillion Powers – M – Notre Dame – Another guy I’ve been talking about for a couple of years now. Powers could have had a Generation adidas deal each of the last two years if he wanted it. Instead he opted to stay in school. He is a consistent two-way midfielder that will fit in nicely for any MLS squad. Ryan Hollingshead – M- UCLA – I saw a lot of this kid last year when I was scouting Kelyn Rowe. He’s an excellent winger that does well on both feet. He is a consistent player that continues to help the Bruins out from game to game. Jose Gomez – M – Creighton – He is a true play maker in the middle of the field. He does well to read the game and contributes a ton of assists in the process. Eric Schoenle – D – West Virginia – He was a GA target last year but he was wise to stick around for another season. He still needs a little more size on him but he’s lead the Mountaineers to a solid record so far this season. Teams will love his ability to get forward on set pieces and provide a nice aerial support. Mikey Lopez – M – UNC – Most agree that he is the most pro ready of any player in college at the moment. He was a huge reason to why UNC won the College Cup last year and his role with the Tar Heels this season has increased even more. The US U-20NTer will likely get offers from all over next year (U20 World Cup) if he doesn’t make the jump to the pros. MLS will want to lock this kid down while they can. Eriq Zavaleta – F/D – Indiana – He’s got off the field issues to sort out but on the field the kid is great. He can play up top or in the back, in a sense he is this year’s Andrew Wenger. Depending on if he signs with MLS and who drafts him will determine where he plays. My gut tells me he ends up playing in the back but I know there are some that want him to be a MLS forward. Andre Blake – GK – UConn – He’s likely the one keeper in this draft that is worth mentioning. He’s big, has good hands and reminds me of some other MLS standouts like Brad Guzan and Sean Johnson. He’s got some little things to improve on like his distribution and decision making. Both will be refined with a MLS coach. Walker Zimmerman – D – Furman – Just the little bit I’ve seen of this kid is enough for me to say he’s ready. He’s got the size and skills to make it in MLS and should be ready for a jump if he wants it. Alfred Komora – F – Akron – He’s been bitten by the injury bug here and there but he reminds me of a young Steve Zakuani. The tools are there, the talent is obvious and it really is just a matter of time. With Caleb Porter on this way out, I see a kid like this taking the jump if something is offered to him. Patrick Mullans – F – Maryland – He’s another ACC guy that puts up big numbers and will attract folks for a GA deal. The thing is, will he take the offer if it comes his way? He could come under dispute for a Home Grown tag though as he’s played with the Fire’s junior side in the past. Still, a big college cup and finish to the season will put him on everyone’s radar. Gyasi Zardes – F – CSU Bakersfield – I saw this kid in person a few weeks ago when they took on SMU. The junior is tied to LA at the moment and if somehow that fell through he’d likely end up in Europe. Still, if he ends up with the Galaxy look out. He’s got all the tools to be a special forward in this league. London Woodberry – D – Maryland – He’s tied to FC Dallas and Schellas Hyndman will be getting a real stud next year with him. He’s helped lead the Terps to the top of the rankings in college soccer this season. Scott Caldwell – M – Akron – I’ve mentioned this kid a few times in the past. Caldwell has ties to New England, so he won’t be a draft pick. Still, New England should be getting a solid young midfielder in Caldwell that has lead the Zips in the last couple of seasons. 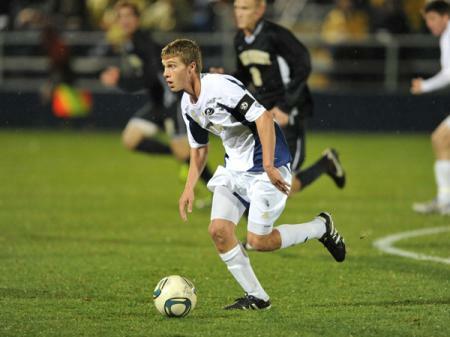 Wil Trapp – M – Akron – The Columbus Crew kid has done very well for himself over the years at Akron. With Caleb Porter on the way out, I see him making the jump after this season. Yes Gentile should be a first rounder, but no mention of Jared Watts surprises me. Best player in ACC and probably all of NCAA. He’s like Michael Bradley. Yes, where is Giuseppe Gentile National Freshman of the year 2011 ? Is College The Best Path For MLS Home Grown Players?